At the launch of the Northern Ireland Centre for Economic Policy (NICEP) with Enterprise Minister, Arlene Foster and NICEP Director Professor Neil Gibson (centre) with sponsors Gerry McGinn, left, Managing Director of First Trust Bank and Len O'Hagan, right, Chairman of the Belfast Harbour Commissioners. 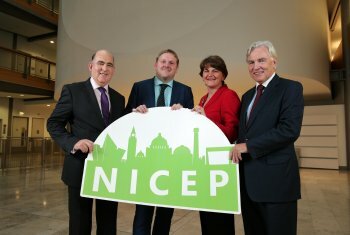 The NI Centre for Economic Policy (NICEP), a new University of Ulster research centre, has been officially opened by Enterprise Minister Arlene Foster. Based at the Ulster Business School and with sponsorship support from the Department of Enterprise Trade and Investment (DETI), First Trust Bank and the Belfast Harbour Commissioners, NICEP will provide Ministers and their officials with independent and robust economic research to inform their economic policy choices. Headed up by Professor Neil Gibson and supported by Associate Directors Richard Johnston and Gareth Hetherington, NICEP will seek to engage with all organisations that have an interest in helping Northern Ireland achieve its economic ambitions. Speaking at the launch, Enterprise Trade and Investment Minister, Arlene Foster MLA welcomed her Departments support for the NICEP, stating: “Not only are we emerging from the deepest recession on record, we are also looking to grow the private sector through our Economic Strategy and secure the best result for Northern Ireland in areas such as Corporation Tax and the Economic Pact. The University of Ulster’s Vice Chancellor Professor Richard Barnett said the role of the Centre would be to challenge and inform decision makers. During the launch, NICEP Director Professor Neil Gibson outlined the Centre’s proposed research programme which includes the development of the first comprehensive macro-economic policy stimulus model of the Northern Ireland economy. Professor Gibson also used the launch event to issue NICEP’s inaugural Economic Outlook. NICEP forecast modest growth of 0.7% in 2013, increasing to 1.5% in 2014 equating to 6,000 net new jobs this year and a further 12,000 in 2014. In the longer term, NICEP forecast on-going austerity, rising interest rates and increased inflation constraining economic growth. In addition, NICEP will be supported in its work by an Advisory Board chaired by Dr Graham Gudgin and which includes representatives from the University of Ulster and the other founding sponsors. Roy Adair, Chief Executive of Belfast Harbour, said, "Belfast Harbour is very pleased to sponsor NICEP. Northern Ireland has faced significant economic challenges in recent years and as a society we need to engage in research and meaningful economic debate to help shape the policy environment that will move us beyond recession, and build a stronger and more vibrant economy. We look forward to NICEP being at the heart of this debate."